some know bugs: car may disapear ... or simply "explose"
Seemed to work fine until I ran into the wooden post thing, which caused me to get stuck. sry for the "wooden post thing" I did not realized that it can stuck the car, I will update that. another update, correcting some bugs, the car turn is now better. 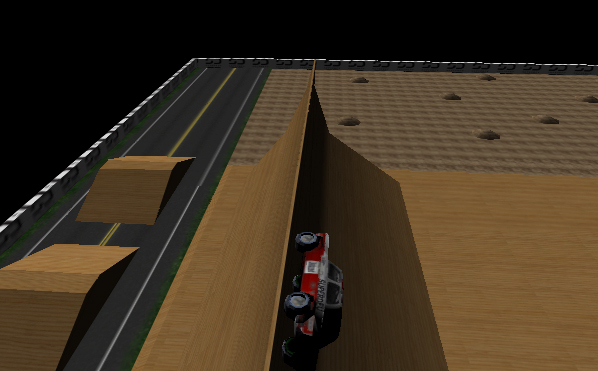 I added a platform that you can reach by driving enought fast on the big blue jump. to avoid to be stuck you can drive even when car is turned upside down, this is not a bug. I noticed the controls are much better on a slower computer. I even ran this through a remote desktop session, where is felt a bit gooey but better to control. Physics seems really framerate dependent. Minor glitch: The applet did not load in Opera the first time I got to the site. After hitting reload it was loading but with white backgroud instead of black (black in FF). EDIT: seems what I said is studip , result should be the same for FPS based, I try on a very slow and very fast computer and got the same results, pressing the front arrow at the applet start (without turning) reach the platform and do a loop by tuching the border of it. Works great, but my car seems to spend 90+% of the time upside down. Seems like when jumping normally, it pretty much always lands on the roof, but flipping back to drive on the wheels is almost impossible. Frustrating. The loader still needs work though - the pacifier gif is causing a flicker in the middle of the applet, right where the car is. Mac OS X Leopard / Safari 3.1. Field of view is too small and it is too dark. I can't tell where I am going. Then I will see something flash by, but lose where it is before I stop. Field of view is too small and it is too dark. I have updated for lightning, do you think I still have to increase FOV, it may look fisheyes it is already set to 60° ? I think the problem with the field of view is that you are always looking at the car, and the camera is not in a fixed position behind the car. When you are going fast and straight, you can see fine, but when you are going slow, and trying to turn around to line up with something, all you get to see is the car and the ground right around it. No. It is a lot better now. for people who dont know there is a joke on google, type : find chuck norris then use the button "I feel lucky" not the search button (for FF user you have to go to google homesite the FF start page dont have this button). WOW! This is amazing and a lot of fun, very well done! Right now it looks and feels a little bit like a remote control toy car, maybe because it has very high top speed and acceleration and/or the car seems to be very light weight. I assume it is configurable, to change the characteristics of the car. I think this would make the basis for a really fun game, are you planning to do that, or are you more interested in concentrating on the engine? I couldn't get the camera controls to work (tested using both FF and IE), it would be interesting to try with a camera closer to the car/ground, or even from inside the car. Looks like it should be good, but far far far too dark so see anything except the occasional highlighted face. Plus the camera seems to be too laggy to properly see where you're going. You should add a turbo boost and maybe experiment with moving the camera down and back slightly in the process. did you try the lastest one ? http://demo.dzzd.net/ROAD3/ it is a lot brighter, isn'it ? for the camera this is normal, controls was only available in the very first demo that have been removed now, in the first demo camera was not linked to the car and you had to manually move it. A bit, but not much. The ground is non-black at least but most of the ramps and car are still pretty much near-black on my system. you may see a black square at the left of the above picture just give me it width in pixel. Looks like a perfectly smooth gradient from black to white to me. Could you post a screenshot from the game running on your config (+specs)? lucky you, I can get that on mine , I have arround 20px maybe 1cm of black before gradiant and I can see most texture details even dark one. thnks, yep, I did not notice as maybe I was not enought 'concentrating' on that , you're absolutly right most jump and the platform are too dark. strange that how you can not see something that is in front of you eyes. I update right now.